Home sales climbed almost 19 per cent in the Toronto region in July and average prices rose across all housing categories as buyers continued to return to the market after absorbing the impact of tougher new mortgage-qualification rules imposed at the start of the year. The Toronto Real Estate Board (TREB) said 6,961 homes were sold in the GTA in July, up 18.6 per cent from July last year. The improvement came off a particularly weak base a year ago, however, when sales were down 40 per cent following the province’s introduction of a foreign-buyers tax as part of its Fair Housing Plan. The average GTA home sold for $782,129 in July, an increase of 4.8 per cent from a year earlier, and a jump of 3.1 per cent compared with June, based on TREB’s preliminary seasonal adjustment. TREB said July’s average sale price was the highest since May, 2017, on a seasonally adjusted basis, while the number of homes sold in July was up 6.6 per cent over June after seasonal adjustment. TREB said the number of sales in July was the highest this year on a seasonally adjusted basis. TREB says sales in the GTA were up 18.6 per cent in July, compared with the same time last year. “We have certainly experienced an increase in demand for ownership housing so far this summer,” Jason Mercer, TREB’s director of market analysis, said in a statement. Sale prices in July climbed for all categories of homes in the GTA, including detached houses, where sales had been especially weak. TREB said the average detached house sold for $1,004,647 in July, up 0.5 per cent from July last year. The number of detached homes sold in July climbed 27 per cent compared with the same month last year, which was the strongest sales growth of any home category. TREB said semi-detached home prices rose 6 per cent in July from a year ago to a GTA average of $746,843, while townhouse prices climbed 4.1 per cent to $633,993; condominium prices were up 8.9 per cent on a year-over-year basis to $546,984. New listings have not picked up as quickly as sales, however, with 13,868 homes put on the market in July, down 1.8 per cent from 14,122 homes a year ago. Toronto’s market cooled sharply earlier this year after the federal government introduced a new stress test on mortgage applications, requiring buyers to show they could still afford their mortgages even if interest rates were significantly higher. Total sales for the first seven months of the year were down 23 per cent to 46,834 homes from 60,620 in the first seven months of 2017, with the improvement in sales in July not enough to offset large declines earlier in the year. 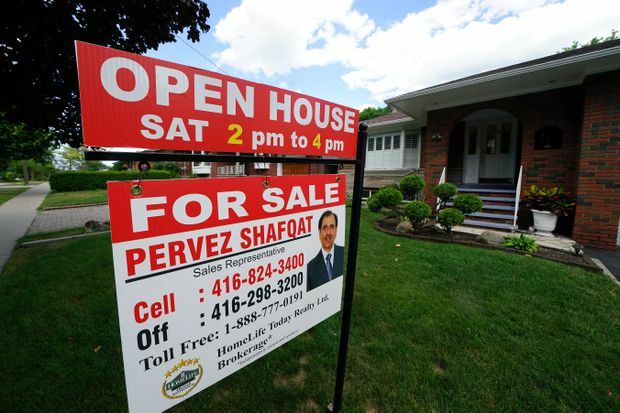 Shawn Zigelstein, a Royal LePage real estate agent in Richmond Hill north of Toronto, said the market feels stronger than last summer, but that was a particularly weak period to use as a comparison. He said the recovery in his region is still spotty, and there are pockets where prices are still dropping and the ratio of inventory to monthly sales has reached 12 months – which means there are many listings sitting on the market without a buyer. “Some areas only have two to three months [of inventory] so there are drastic comparisons,” he said. He said the perception that the market is improving may bring more buyers off the sidelines, but he isn’t confident prices are set to rise significantly. His clients also have a lot of new listings coming in the next four weeks, which could flood the market and keep prices from rising significantly. “If you’re looking at York Region and Richmond Hill specifically, we’re seeing a lot of inventory coming up,” he said.